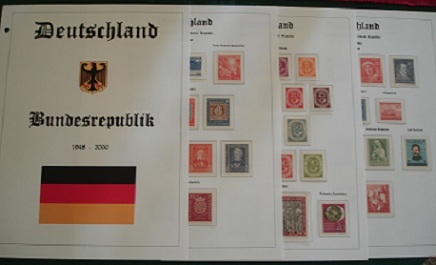 Custom stamp album pages are becoming increasingly popular. These days, people may collect parts of one country, or parts of several countries, or they may collect one or more thematic subjects, containing stamps, blocks, covers, postcards, etc. A philatelist, on the other hand, may want to write up a special study of postmarks or maybe all the plate varieties of a particular classic stamp, which would fit more into an exhibit format. These options just would not be very well served by a commercial album. I remember, back in the 1980's, I would either buy heavy gauge three-ring binder quadrilled pages for exhibits, or blank pages for my Scott Specialty albums, for my collection. I then had to design what I wanted, then measure and draw the squares for the stamps in black ink, then I would have to insert the page into a typewriter and type the headings and the text. One page, this way, would sometimes take hours! And then the process sometimes had to be repeated many times for each page, due to unsightly errors. Since the late 1990's though, we have had computers, with word processing or drawing software and printers, which now make the job of producing customized stamp album pages very easy. In the 21st Century now, just about everybody has a PC, a printer, and Microsoft Word or a similar word processing / drawing package. With these every day tools, you can make professional looking, exhibit quality, stamp album pages for a net cost of a less than a penny each. I began making my own stamp album pages back in the late 1990's, utilizing my PC, Microsoft Word '97, a laser printer with black toner, and a ruler for measuring the stamps sizes. Since I've always used Word '97 for my page designs, I still use it, though copies of the software are getting tough to find. Any version of Word, or any other word processing or drawing software will work though. Here is a SAMPLE (in PDf format) of a Switzerland album page I did for the 1854 Imperforated Seated Helvetia issue, utilizing Microsoft Word '97, about a year ago. Here is a SAMPLE (in PDF format) of another album page, containing variable sized stamp spaces. I use a laser printer and White 90# Index paper to print the stamp album pages. I three-hole-punch the pages and then insert them into black three ring binders, with label pockets on the spine. I then print and cut out the labels for the volumes and insert them into the label pockets. The paper costs about $60 per case (2500 sheets) and the binders, bought in bulk, cost about $2 each. About 40 printed pages fit in one of my one-inch binders. With a little time and effort, a professional looking customized album binder with 40 printed stamp album pages, costs me about $2.10. What would a Davo or Lindner volume of that size cost? Maybe about $60.00 or $80.00? The worst part, initially, is creating your album layout template ... getting the border lines setup up correctly, determining the dimensions of the frames, choosing the right fonts for your page, getting the headings and text lined up, and then creating, spacing, and labeling your stamp squares. This may take you between a few hours and a few days to do, but once you have your template ready, you will never need to do it again. When I create a new country album or just an extra page for an existing country binder, I use the "cloning" method, similar to what applications programmers do these days. No one wants to write a brand new program from scratch, every time they do an application enhancement, and the same should be true for album page templates! First, I find an existing page document that looks similar to the new one I want to create. Then I save the document under its new name. I then change the heading and text for the new stamp arrangement I want to put on the page. Next, I take a ruler and measure the dimensions of each stamp I want to mount on the page -- this is even easier if all the stamps are the same size -- and size a box on the new page, to match the measurement of the stamp(s), with a little extra spacing, to allow for the size of the stamp mount that will be affixed over the stamp square. Before committing the new design to an album page, I always print off a sample on a piece of regular printer paper, to see if the boxes are big enough for the stamps in their mounts. Sometimes this has to be repeated. Once the page design is "perfect", insert your sheet of 90# paper in the printer and print it out. Punch the paper for the binder, insert the page, and now you are ready to mount your stamps on the new album page. This whole process takes about 10 minutes for each page, or maybe a little longer, if the page has variable sized squares on it. IT IS ACTUALLY VERY EASY!